Certain model year 2012 Ghost passenger vehicles manufactured from March 27, 2012, through July 13, 2012 were equipped with 20-inch tires, but the tire information label states that the vehicles were equipped with 19-inch tires. Therefore, the label does not conform to the requirements of Federal Motor Vehicle Safety Standard No. 110, “Tire Selection and Rims." Incorrect tire placard information such as an incrorrect recommended pressure may lead to tire inflation errors which could result in tire failure, increasing the risk of a crash. Got a lemon Rolls-Royce Ghost? 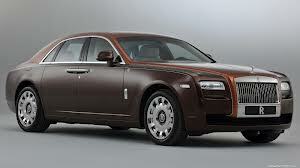 Want a new Rolls Royce or your money back?